So, TpT has an annual tradition of offering a site-wide coupon code to be used at checkout and encouraging individual sellers of throwing their own sale to coincide, and to offer you the best deals possible. August 4-5 are the dates this year, and I'll be browsing, even though I don't go back to school for almost a full month after that. For the middle & higher grades, here are some secondary sellers who are participating in the sale. 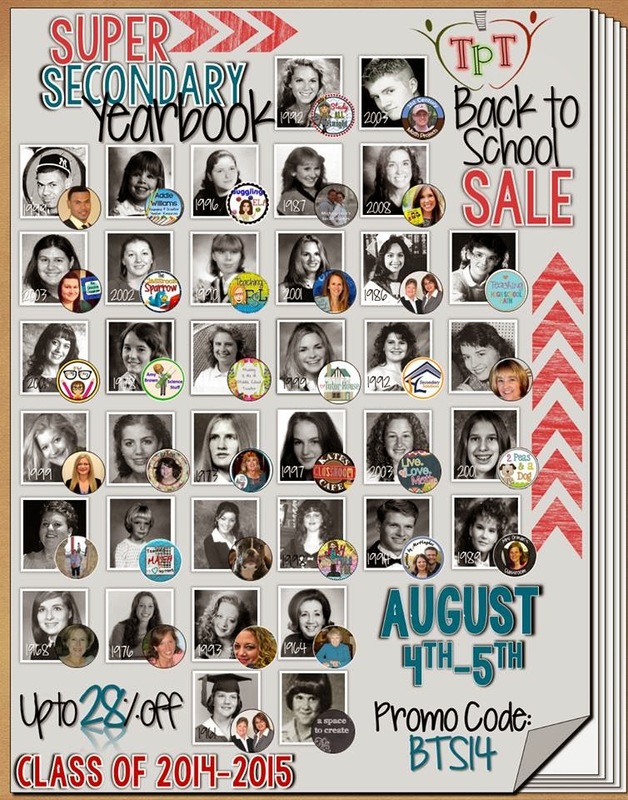 Be sure to have a laugh at our expense - check out our old grad or yearbook photos below, and then scroll on down for a clickable list of our stores. These secondary teacher-authors are all having sales up to 28% OFF! Danielle Knight put together the secondary teachers' pictures above to make the fun yearbook page for us, so a special shout out to her. Of course, you'll be able to tell how creative she is from her TpT store, and if you check out my recently updated logo on TeachersPayTeachers, Twitter and facebook, you'll get to admire more of her handiwork. What KIND of French are we learning, anyhow?